The bones of this genealogy where found on the internet in the 9190's at Family Search Internet Genealogy using the following resources: Ancestral Files & International Genealogical Index, I am not sure how accurate it is. I also use the Cornwall OPC Database & Find my Past. You do need to look at both places because they have some different records. Also sometimes the OPC records have more information on them like witnesses at weddings and occupations of fathers. Remember: Baptism dates are NOT birth datse!! Baptism can happen any time after a child is born. Baptism place is Not necessarily where the child was born or where the family lives. I've been doing research on this family again & have found lots of issues that need fixing. So the following is what has been the traditional PASCOE genealogy & my questions & findings. John PASCOWE born about 1542 in England. He was buried 22 Sep 1623 in Gerrans, Cornwall. Jane PASCOWE bap. 16 Apr 1568. Christian PASCOWE bap.10 Dec 1570. Buried 21 Apr 1589 Gerrans, Cornwall. Thomas PASCOWE bap. 1 Sep 1573. Thamsyn PASCOW bap. 1 Sep 1573. Maryn PASCOW bap. 5 Jan 1575. Elinor PASCOW no christening record only burial. Bur. 5 Mar 1578 Gerrans, Cornwall. Salomon PASCOW bap. 25 Oct 1578. Helen PASCOW bap. 12 Feb 1583. Buried 16 Dec 1591 Gerrans, Cornwall. John PASCOW bap. 16 Jul 1586. See more on his family in the box below. Tristram PASCOW bap. 9 Feb 1591. John PASCHOW was born about Jul 1583 in Gerrans, Cornwall. He was the son of John PASCOE & unknown. He was buried 29 May 1669 in Gerrans, Cornwall. John married 6 Feb 1614 in Gerrans, Cornwall to Elizabeth CRIGGOW. She was buried 26 Oct 1626 in Gerrans, Cornwall. Peares PASCOW bap. 17 Feb 1614. See more on his family in the box below. Maude PASCOW bap. 2 Jun 1616. Mary PASCOW bap. 11 Mar 1617. John PASCHOW bap. 26 Mar 1620. Buried 15 Jun 1620. Henry PASCOW bap. 6 May 1621. Elizabeth PASCOW bap. 14 Apr 1624. Peares PASCOW was born about Feb 1614 in Gerrans, Cornwall. He was the son of John PASCOE & Elizabeth CRIGGOW. He married 25 May 1641 in Gerrans, Cornwall to Mary BABB. She was christened 17 Dec 1617 in Gerrans, Cornwall. She is the daughter of William BABB & Grace DAVYE. Notes: wife of Pears. She had no coffin. Notes: He had a coffin. Elizabeth PASCOE bap. 4 Mar 1641. Ferdinando PASKO bap. 19 Jan 1644. Christian PASCOE bap. 2 Sep 1649. John PASCOE bap. 8 Aug 1652. According to old genealogies Pearce & Mary had a son named Pearce. I have found no christening/birth record for him. They also may be the parents of Robert PASCOE who married 30 Aug 1674 or 1687 in Kenwyn, Cornwall to Constance CHEWELL. See more on Pearce’s family in the box below. Pearse PASCOE was born about 1656 in England. His parents maybe Pearce PASCOE & Mary BABB (see box above). He married 24 Apr 1681 in Kenwyn, Cornwall to An BONITHON. I assume Ann BONITHON died in childbirth. I have found no christening or burial record for a child. Thomas PASCO bap. 2 Feb 1685. Honor PASCO bap. 1 Apr 1689. Arthur PASCO bap. 6 Mar 1691. Ann PASCOE bap. 21 Feb 1694. James PASCHOE bap. 3 Sep 1698. George PASCOE bap. 7 Mar 1700. This could be the same Pearce with 2d or 3rd wife. This Pearce PASCOE was buried 9 Feb 1737 in St. Just in Roseland. According to old genealogies Pearce & Ann had a son named Pearce. I have found no christening/birth record for him. See more on Pearce’s family in the box below. Pearce PASCO was born about 1682. His parents maybe Pearce PASCOE & An BONITHON (or another unknown wife). He was buried 5 Apr 1763 at Truro St. Mary, Cornwall. He married 8 Oct 1709 in Kenwyn, Cornwall to Elizabeth OSBORN. She was christened 25 May 1684 in Perranzabuloe, Cornwall, daughter of Michael OSBORN. Elizabeth was buried 12 Feb 1760 at Truro St. Mary, Cornwall. Ferdinando PASCO bap. 6 Jul 1710, Kenwyn, Cornwall. John PASCOW bap. 27 Dec 1711, Truro St. Mary, Cornwall. See more on his family in the box below. Elizabeth PASCOE bap. 27 Feb 1713, Perranzabuloe, Cornwall. Pearse PASCOE bap. 10 Dec 1715, St. Agnes near Truro, Cornwall. Michael PASCOE bap. 9 Mar 1716, St. Agnes near Truro, Cornwall. William PASCOE born about 1709 to 1718. Buried 20 Oct 1718 Kenwyn, Cornwall. John PASKOE of Penzance is a Junr as in his father is John not Pearce. If this is the correct John & Grace then the ancesters are all wrong. This John & Grace had five children in Penzance, they stopped in 1742. They could have moved to Truro by 1745 and had three more children. Back to John's ancestors - I found a John in Pezance who had a son John baptized on 4 Sep 1706 but he died in 1715. This same John had a replacement John in 1715. He would have been 17 at the time of the marriage so he is too young. So, this John Jr could have come trom the Truro area originally, but who are his parents? The only Grace BEARD I found was baptized 14 May 1706 in Bodmin, on the other side of Cornwall. Her family (father John BEARD) could have moved to Penzance from Bodmin, just as John's family could have moved from Truro to Penzance. I also found this other John & Grace. They are in the Truro, Gerrans, and Kenwyn area. They had two children in Philleigh and could easily been in Truro by 1745. Now this John's father could be Richard PASCO of Philleigh who had a son John baptized on 17 Jan 1703 in Philleigh. If Richard is the father of John, the family shows up in Philleigh in 1700 with the baptizem record of Richard Jr. Or he could also just as easily be the son of John & Elizabeth (OSBORN) PASCOW. I have found one Grace OATS in the area who was baptized on 21 Aug 1714 in Gwennap, daughter of Nicholas OATS. On her brother Nicholas' record it has Kenwyn as residence. She would be closer in age with John son of Pearce who was born about 1711. The children of John & Grace PASCOE christenings in Truro..
More on Pearce PASCOE & family in the box below. Pearce PASCOE was born about Sep 1747, Truro, Cornwall, England. He was buried 20 Feb 1803 at Truro, St. Mary.He married 25 Sep 1768, Truro, Cornwall, England to Honor ALEXANDER. . Here is another issue. - the only Honor Alexander I have found is from the right area but she's ten years older than him. The marriage isn't impossible - the average age for marriage at that time was about 26. Honor was born about Feb 1737, Truro, Cornwall, England. Her parents are John & Susanna (WEBBER) ALEXANDER. She was buried 2 Mar 1783 in Gerrans. She died from the Bloody Flux. Grace PASCO bap. 17 Sep 1769, bur. 13 Jan 1771 Truro, St. Mary. John PASCO bap. 8 Aug 1773 Truro, St. Mary. Michael PASCOE b. 17 Dec 1775, bap. 7 Jun 1776 at Bethesda Chapel-Independent,Truro, Cornwall. See more on his family in the box below. Michael PASCOE b. 17 Dec 1775, Truro, Cornwall, England, d. 15 Nov 1837 in Truro, Cornwall, England. He married on 27 Jul. 1795, in Kenwyn, Cornwall, England to Elizabeth DALBY, b. Jan 1774 in St Pinnock, Cornwall, England, died 17 Jan 1854 in St Clement, Truro, Cornwall, England. Her Parents were the Rev. Samuel Cockram DALBY & Mary CORY. On Wednesday, at Truro, Mr. Michael Pascoe, aged 73 years, after a protracted illness, which he bore with Christian resignation. This guy is 10 years too old but place & time are correct. Michael was not in the 1841 census. At Rosewin, Truro, on Tuesday last, Elizabeth, widow of the late Mr. Michael PASCOE, currier, aged 80 years. Richard PASCOE, b. 31 MAR 1796, Truro, Cornwall, England. Susannah Dalby PASCOE b. 23 Apr 1797, Truro, Cornwall, England, d. Jul 1870 in St Clement, Truro, Cornwall, England. John PASCOE b.5 Feb 1799, Truro, Cornwall, England. Dalby PASCOE b. 19 Dec 1806, Truro, Cornwall, England, d. Nov 1830,Surrey, England. He was a photographer. William PASCOE b.3 Jan 18099, Truro, Cornwall, England. d bef Sep 1810, Truro, Cornwall, England. William PASCOE b.2 Sep 1810, Truro, Cornwall, England. Mary PASCOE b. 31 Dec 1813, Truro, Cornwall, England, d. Oct 1887,St Clement, Truro, Cornwall, England. She married Edward TUCKER, b. abt 1812 , Bideford, Devon, England. Richard PASCOE, b. 31 Mar 1796, Perranzabuloe near Truro, Cornwall, England, d. 5 Mar 1877, Woodstock, Oxford, Ontario, Canada. On 22 Feb 1816 in Truro, Cornwall, Richard joined His Majesty's corps of Royal Sappers & Miners. m circa 1820, England to Mary A BOWHAY, b. abt Feb 1790, Calstock, Cornwall, England, d. bef. 1861, Woodstock, Ontario, Canada. I have not found any record of their marriage or proof of her maiden-name. Also having problems verifying children. I did find the marriage of Robert PASCOE & Mary Ann PLATLOW, 19 Apr 1819 in Rochester, Kent, England. Richard PASCOE was a soldier in his Majesty's Royal Sappers & Miners . Located in Woolwich, Kent, England is the Royal School of Military Engineering (RSME) it is the main training establishment for the British Army's Royal Engineers. PASCOE--In Woodstock, on the 5th inst., Richard Pascoe, in the 80th year of his age. Susanna Matilda PASCOE b. Oct 1848, Woodstock, Oxford, Ontario, Canada. Married 2 Aug 1866 in Woodstock, Oxford, Ontario, Canada to Samuel ELTOM. Richard A. PASCOE b. Oct 1849, Woodstock, Oxford, Ontario, Canada, d.1 Feb 1878, Woodstock, Oxford, Ontario, Canada. Charles J PASCOE b. 28 Dec 1851, Woodstock, Oxford, Ontario, Canada. 3) Matilda PASCOE was born on 19 Jan 1827 in Woolwich, Kent, England (parents Richard & Mary Ann). She died abt 1856, Woodstock, Oxford, Ontario, Canada. She married on 7 Feb 1847 in Woodstock, Oxford, Ontario, Canada to Donald McCULLOUCH. John McCULLOCH b abt 1847. Mary A McCULLOCH b abt 1850, d. Dec 1909, Tacoma, Pierce, Washington, m Alexander BAIN. May M. McCULLOCH b abt 1854. Matildaa McCULLOCH b abt 1856, d. 1 Jun 1916, Seattle, King, Washington, m KIRKPATRICK. 4) Charles PASCOE b. 17 May 1829 , East Stonehouse, Devon, England, d. 2 Oct. 1886, Los Angeles, California. He married on 28 Sep. 1855, Woodstock, Oxford, Ontario, Canada to Mary Ann "Annie"DITTON, b. 28 Apr. 1834, at sea. I have not found any birth record of Charles. In the 1871 Census Richard was living with Charles & family. More information on this family in the box below. 5) George Emanuel PASCOE, b. 11 May 1831, Stoke Damerel, Devon, England, d. 18 Aug 1832 in Quibec, Canada. Death record states Richard as his father. Percival Everand PASCOE b. 22 Oct 1877. Melville Le Roy PASCOE b. 4 Apr 1879. Mortimer Garfield PASCOE b. 28 Sep 1881. William Arthur PASCOE b. 5 Mar 1885. Cecil Ray PASCOE b.26 Apr 1886. Violet Pearl PASCOE b. 27 Aug 1886, d. 21 Dec 1888, Woodstock, Oxford, Ontario, Canada. Bernie PASCOE b. 18 Sep 1890, d. 21 Oct 1893, Woodstock, Oxford, Ontario, Canada. Leta May PASCOE b. 20 Mar 1892, m Joseph BROOKS. 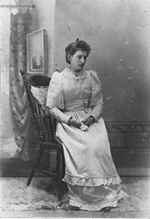 Annie Sarah PASCOE b. 23 May 1868, m circa 1895, Albert WINDSOR. Arthur G. PASCOE b. 14 Feb 1871, d. 6 Jan 1877. Helen Gertrude PASCOE b. circa 1874, m 17 Dec 1901, Robert MACKAY. Martha Lapetta PASCOE b. circa 1877, m 29 Jan 1914, Alfreo Cawley WHITE. Mabel Louise PASCOE b. 11 Nov 1879, m 9 Oct 1907, Robert MACKAY. Charlotte Grace PASCOE b. circa 1883, m 18 Oct 1904, Reuben H. WALTON. Kathleen Lenove PASCOE b. circa Jan 1890, d circa Jun 1890. Charles PASCOE b. circa 1832, Cornwall, England, d. 2 Oct 1886, Los Angeles, California, m 28 Sep 1855, Woodstock, Oxford, Ontario, Canada to Mary Ann "Annie" DITTON b. 28 Apr 1834, at sea on the "British Tar", d. 11 Mar 1913, los Angeles Co, CA. Annie moved to CA circa 1885. Edith Tabitha Le Pelletier PASCOE, b. 5 Jun 1857, d. 11 Oct 1922, Los Angeles Co. CA, m 21 May 1878, in Woodstock, Oxford, Ontario, Canada to Robert Wesley BOWES. more on this family below. Annie Leola PASCOE, b. 22 Apr. 1859, d. 20 Feb 1937, Los Angeles Co. CA, m circa 1891, Woodstock, Oxford, Ontario, Canada to Dewitt KING. more on this family below. Charles Edmond or Edward PASCOE, b. 3 Nov. 1861, d. bef. 1937, m 23 Jan 1889, Greenville, Montcalm, Michigan to Lottie C. CRIPPEN b. abt 1872, Ionia County, Michigan. Alfred PASCOE, b. 24 Nov. 1865, d. 9 Feb. 1945, (Puenta) Pomona, Los Angeles Co, CA. more on this family below. Mary PASCOE, b. 1 Dec 1867, d. 11 Mar 1937, San Bernardino Co, CA; m 14 Sep 1887, Los Angeles Co, CA to William Henry JOHNSON. more on this family below. William PASCOE b. circa 1869. Annie G. PASCOE, b. 23 Aug. 1870, d. 27 Feb 1944, Orange Co, CAm 14 Oct 1890, Los Angeles Co., CA to William DRUMM. more on this family below. George J. PASCOE, b. circa 1875, d. 26 Jun 1945, San Bernardino Co, CA. came to CA circa 1890. Isabelle Maria PASCOE, b. 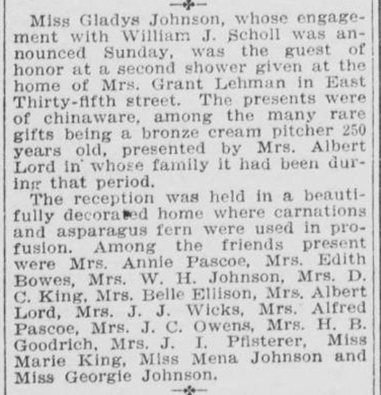 14Dec 1874, d. 27 Oct 1939, Long Beach, Los Angeles Co, CA; m 8 Aug 1900, Los Angeles Co., CA to William Grant LEHMAN more on this family below. more Pictures of unidentified family and friends. Robert Wesley BOWES b. 2 Oct 1855, Whitby, Ontario, Canada, d. 25 Jun 1918, Los Angeles Co., CA; m 21 May 1879, Woodstock, Oxford, Ontario Canada to Edith Tabitha Le Pelletier PASCOE, b. 5 Jun 1857, Woodstock, Oxford, Ontario, Canada, d. 11 Oct 1922, Los Angeles Co. CA. Circa 1887 the family moved to Los Angeles Co, CA. Emma Leola BOWES, b. 24 Mar 1880, Woodstock, Oxford, Ontario, Canada, d. 16 Dec 1958, Los Angeles Co, CA; m 17 Aug 1904, Los Angeles Co, CA to Herman B. GOODRICH b. 28 Feb 1870, Chicago, IL, d. 18 Jan 1961, CA. One known child: Elizabeth m RUSHTON. Eva Ella BOWES, 29 Nov 1881, Woodstock, Oxford, Ontario, Canada, d. 12 Jun 1965, Los Angeles Co, CA; m 1 Jan 1905, Los Angeles Co, CA to Jasper C. OWENS b. 24 Jun 1879, CA, d. 19 Dec 1957, Los Angels Co, CA. They had 2 children: Edith Ruth m Ralph A. WILSON & Eva Bernice m Loren E. CRISS. Wesley F BOWES b. 25 Oct 1883, Woodstock, Oxford, Ontario, Canada, d. 23 Jan 1940, Sacramento Co, CA. Howard Milton BOWES b. 17 Nov 1896, Los Angeles Co, CA, d. 14 Jun 1960, CA; m 23 Oct 1919, Los Angeles Co, CA to Louise Catherine AVIS. Three known children: Howard M, Urdath L, Marion Annie, all born in the Bay Area. Dewitt Clinton KING b. 20 Dec 1861, MI, d. 3 May 1953, Los Angeles Co, CA; m 24 Aug 1886, Woodstock, Oxford, Ontario, Canada to Anna Leola PASCOE b. 20 Apr 1859, Woodstock, Oxford, Ontario, Canada, d. 20 Feb 1937, Los Angeles Co, CA. Came to CA circa 1893 from MI. Marie A. KING b. 26 Oct 1887, MI, d. 28 Jul 1975, Los Angeles Co, CA; m Henry BOULANGER b. 1 May 1887, IL, d. 27 Jan 1953, Los Angeles Co., CA. Charles Burton KING b. 3 Jun 1889, MI, d. 20 Feb 1960, San Diego Co, CA; m Irene E. EDWARDS b. 14 Dec 1894, d. 3 Aug 1987, San Diego Co, CA. Charles Burton KING b. 9 Dec 1917, Orange Co, CA, d. 14 Aug 2001, Ramona, San Diego, CA.. 3 known children. Alfred Pascoe b. 24 Nov 1865, Woodstock, Oxford, Ontario, Canada, d. 9 Feb 1945, (Puente) Pomona, Los Angeles Co, CA; m. 1st. 18 Jul. 1892 in Pomona, Los Angeles Co. CA. to Katherine Cornelia BOND, b. 16 Dec. 1870, in Minneapolis, Minn, d. 10 Aug 1946, Riverside CA. Alfred moved to Pomona CA, from Woodstock, Canada, circa 1888. 1)Corinne PASCOE, b. 3 May 1893 Los Angeles Co. CA; d. Jul. 1981 Los Angeles CA. m 1st ca 1918 James ZICOVICH, b. abt 1880 CA. They had a little girl, Mary Ellen b.30 Aug 1919, d. 29 Mar 1923, who died in a fire, she was playing with matches. m 2d. 5 May 1923, Riverside County, CA, Robert L. HARMON b. 1887, KY.
m 3d. 14 Aug 1930, Los Angeles CA to Herbert Hudson KELLY, b. 16 Mar. 1889, England, d. Jul 1979, Los Angeles Co. CA. 2)Walter Bond PASCOE, b. 27 Feb. 1895, Los Angeles Co. CA, d. 15 Jul. 1951, San Bernardino, CA; m 1st. 1 Dec. 1919 in Westwood, CA. to Helena NICOLAUS, b. 3 Oct. 1899, Union House/Elk Grove, CA, d. 4 Oct. 1887, Sacramento, CA. They had three children, m 2d to Chloe. Alfred m his 2nd. wife Anna PFISTERER in 1909 in Whittier CA. Anna was born 3 Jan. 1880, in Whittenberg, Germany, she died 23 Feb. 1947 in (Puente) Pomona, Los Angeles Co. CA. They had a son, Mart John PASCOE b. 2 Sep. 1910, Whittier CA, d. 5 Oct. 1985 in Yuba Co. CA. He m 17 May 1952 in Whittier to Alice Eda LEVO. They had a son Robert John PASCOE. William Henry JOHNSON b. 21 Feb 1861, Woodstock, Oxford, Ontario, Canada, d. 4 Oct 1952, Los Angeles Co, CA; m 14 Sep 1887, Los Angeles Co., CA to Mary PASCOE b. 1 Dec 1867, Woodstock, Oxford, Ontario, Canada, d. 11 Mar 1937, San Bernardino Co, CA. Circa 1887 they moved to Pomona, Los Angeles Co, CA. Gladys JOHNSON b. 27 Jan 1890, Pomona, Los Angeles Co, CA; d. 13 Apr 1976, Los Angeles Co, CA; m 1st. William Theodore SCHOLL, 2d. MYERS. Albert Wallace RIMPAU b. 10 Apr 1909, Los Angeles Co, CA; d. 16 Apr 1987 , Los Angeles Co, CA; m Betty Lou AMUNDSON. Edward W. RIMPAU b. 20 Jul 1914, Los Angeles Co, CA; d. 23 Feb 1971, Los Angeles Co, CA; m Betty F. SEEBALDT. Georgia Bell JOHNSON b. 6 Sep 1895, Pomona, Los Angeles Co, CA; d. 3 May 1972 , Los Angeles Co, CA; m Robert JENSEN. William Merritt DRUMM b. Apr 1868, Delaware Co, IN, d. 14 Oct 1937, Los Angeles Co., CA m 14 Oct 1890, Los Angeles Co., CA to Annie G. PASCOE b. 23 Aug 1870, Woodstock, Oxford, Ontario Canada, d. 27 Feb 1944, Orange Co., CA. Annie came to CA circa 1890. Della / May? DRUMM b. Los Angeles Co, CA., d. before 1900, Los Angeles Co, CA. Neville DRUMM b. 29 Jun 1892, CA; d. 4 Jun 1944, Pomona, Los Angels Co, CA; m Stella P. b. 24 Jun 1893, KN; d. 6 Sep 1977, Los Angels Co, CA. Gertrude DRUMM b. Sep 1899, Los Angeles Co, CA; m Abner Thalis WILSON. Willa DRUMM b. circa 1907, Los Angeles Co, CA; m Roy E. Garrison, had son Roy Edward Garrison. Robert DRUMM b. circa 1909, Los Angeles Co, CA. Drumm, William - Head; DOB: April 1868; Age: 32; m: 11 y; b: IN; Father b: PA; Mother b: IN; Occupation: Painter. Drumm, Annie - Wife; DOB: August 1871; Age: 29; m: 11 y; Ch: 3, Living: 2; b: Canada; Father: England; Mother: Canada. Drumm, Neville - Son; DOB: June 1892; Age: 8; b: CA; Father: IN; Mother: Canada. Drumm, Gertrude - Daughter; DOB: September 1899; Age: 9 m; b: CA; Father: IN; Mother: Canada. William Grant LEHMAN b. c. 1865, Illinois, d. before 1930, Los Angeles Co., CA m 8 Aug 1900, Los Angeles Co., CA to Maria IsabellePASCOE b. 14 Dec 1874, Woodstock, Oxford, Ontario Canada, d. 27 Oct 1939, Long Beach, Los Angeles, CA. Belle came to CA circa 1888. Frances LEHMAN was born on 1 Sep1902 in Los Angeles California. She died 16 Aug 1994 in Albuquerque, Bernalillo, New Mexico. She married 8 Sep 1923 in Santa Ana, Orange, California to Francis WEST. Dorothy Jane LEHMAN b. 15 Jul 1913, Los Angeles California. She married first 2 Sep 1930 in Glendale, Los Angeles, California to George Walker MASON. She marrie second on 2 Aug 1939 in Long Beach, Los Angeles, California to Cyril Merle KRIGER.